Digital printing refers to methods of printing from a digital based image directly to a variety of media. There are advantages of inkjet production presses over toner (electrophotographic) based devices. Toner based digital is primarily used for on-demand/short run four color printing that requires a quick turnaround time with the ability of modifying the image/text (variable data) per each sheet of paper at a high quality. Inkjet presses are more versatile and have the same modifying capability but currently lack the color consistency and production speeds of a toner based digital device. Inkjet printing utilize solvent, aqueous and UV print technology. Signs/large format, books, transactional print and direct mail make up the categories that benefit from inkjet. These presses are made to print in a wide variety of sizes (books to billboards) and can print one color up to multicolors including white on rigid or flexible substrates. Offset printing has been around for more than a century and has been the best way to print just about everything commercial: newspapers/newsletters, magazines, booklets, postcards, brochures and more. Offset printing works by transferring ink from a plate to a rubber blanket, which then transfers the ink onto the paper. This is in contrast to digital printing, which does not use plates to transfer ink to paper. Offset presses allow for printing on a larger sheet than the traditional toner based digital presses and can print the pieces quicker than the digital presses. 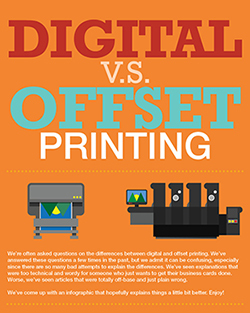 Businesses seeking to maximize their return on investment know that for short runs (1-1500), digital printing is far more economical than offset printing. Since offset printing uses plates and the press has to be individually set up for each job, this set up fee adds upfront money to the print job regardless of quantity. Digital printing does not use plates, no set up fees are involved so a flat price per piece is paid.